This was a huge auditorium with many types of games available for free play. There are many rows of tables with all the known consoles in existence with favorites like the Street Fighter series, newer games like Gundam for PS4 and even older games like a Nintendo based Bionic Commando. 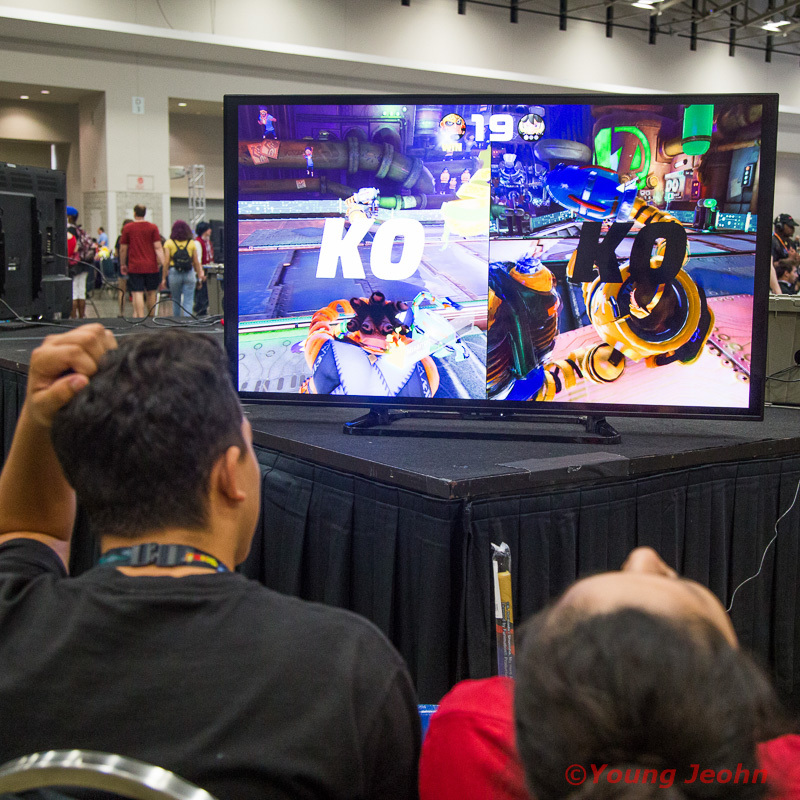 People were crowded around huge flat screen tvs, challenging each other's skills while others played co-op type games like Overcooked on a PS2. A lot of merryment, fun and challenge. 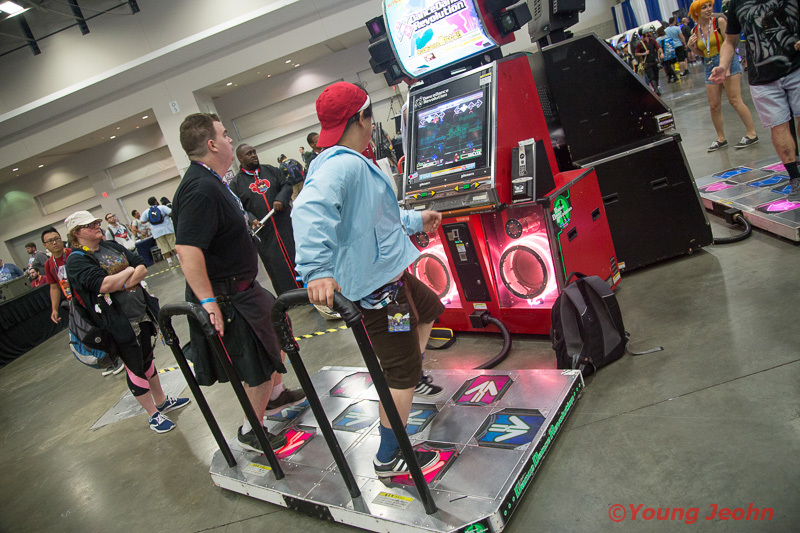 For the traditionalist, there were coin-op favorites like Dance Dance Revolution with pads on the ground to match your dancing to the music (and arrows), taiko drumming, connected Gundam where it feels like you're actually sitting in a Gundam cockpit and many other tap and movement based games that you just can't experience on a console pad. Need to buy a mystery box or looking for some swag? Otakon made some changes to the floorplan so you'd always have space to move around. No more trying to squeeze past people or getting caught in congestion - there was always a way to move around freely, which was a nice change. Some of the biggest artists had booths there, including some of my favorites like Yuumei and Wlop. There was also a huge presence of Dragonball Z - a huge dragon was set up in the sky under a temple where you could take pictures and see the neweste figurines. A life-size model/statue of Goku, Vegita and some other characters were in place; much like being at a wax museum. The arcade and the dealer areas aren't places where you can make something, so if you have itchy fingers that enjoy creating instead of buying or tapping buttons, Maker Space is for you. It's arts and crafts paradise offering free resources, materials and instruction for you to explore your creative genius. Once you've gotten comfortable, you can take on a challenge project and create something from your own imagination. 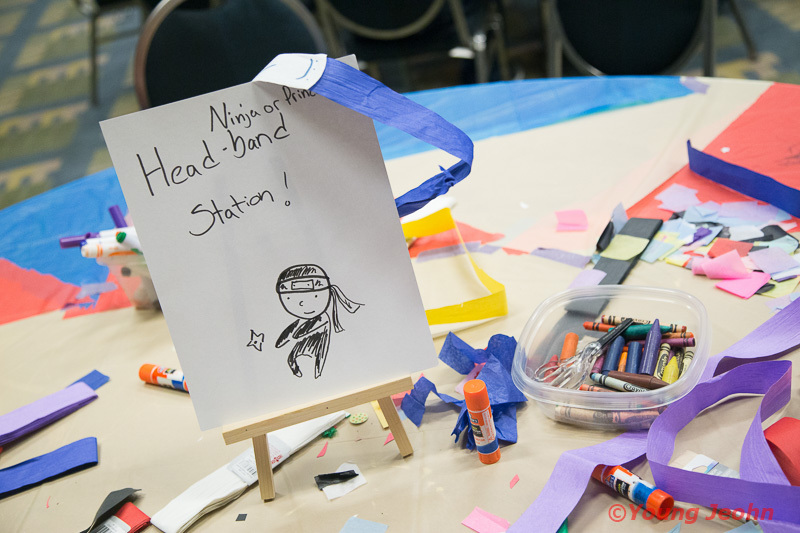 Since most of Otakon is for grown-ups, it's nice to see an activity area for young children to have fun with arts and crafts. There are stations for making crowns, paper swords, drawing, folding origami or playing in mini blow-up castles. 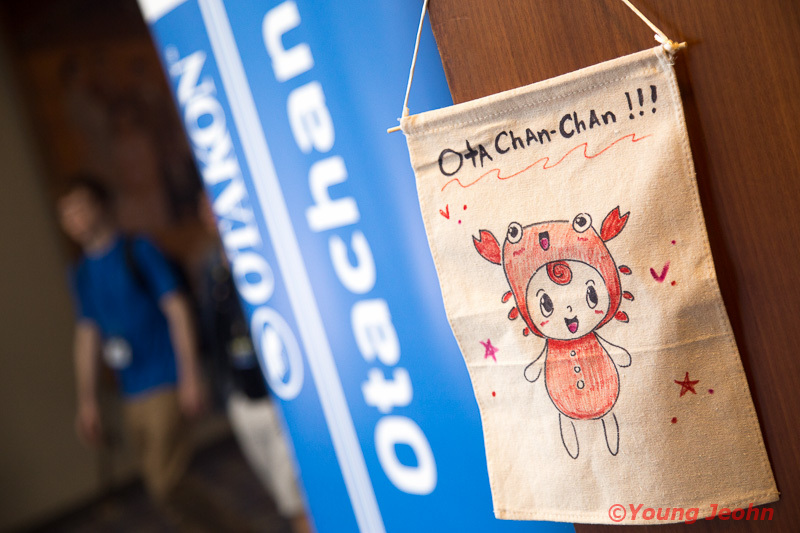 Over the course of the day, Ota Chan would hold contests with prizes offered for the best submissions. Prizes would include some rather desirable plushies, bags and other goodies that anyone (including adults) would love to have. There are lots of cosplayers at Otakon. 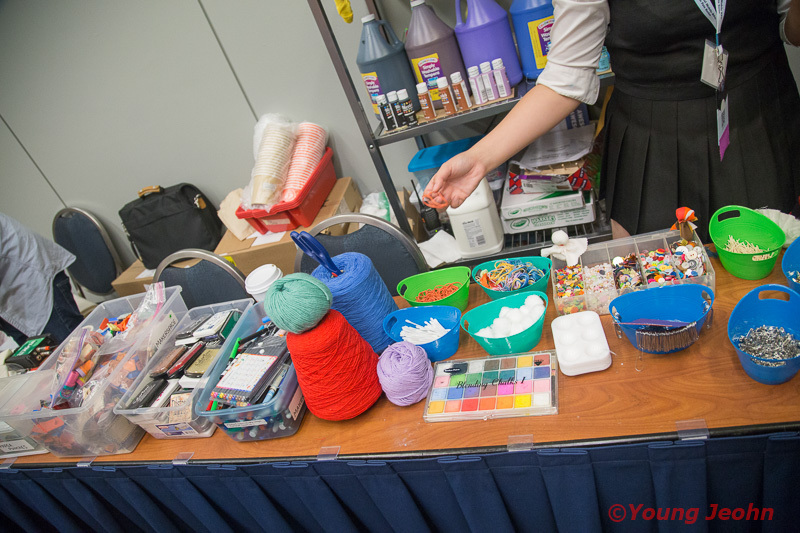 It stands to reason that there will, without doubt, be some costume malfunctions, and Otakon are keen to help! Dubbed the Cosplay Rescue, a room full of volunteers are there to help you fix and patch up anything you're having trouble with. Not very good with a thread and needle? They've got you covered. Forgot to bring duct tape? They have that too. If it's your first time putting on a wig or your Doctor Who screwdriver is falling apart, have faith and don't toss it out yet. 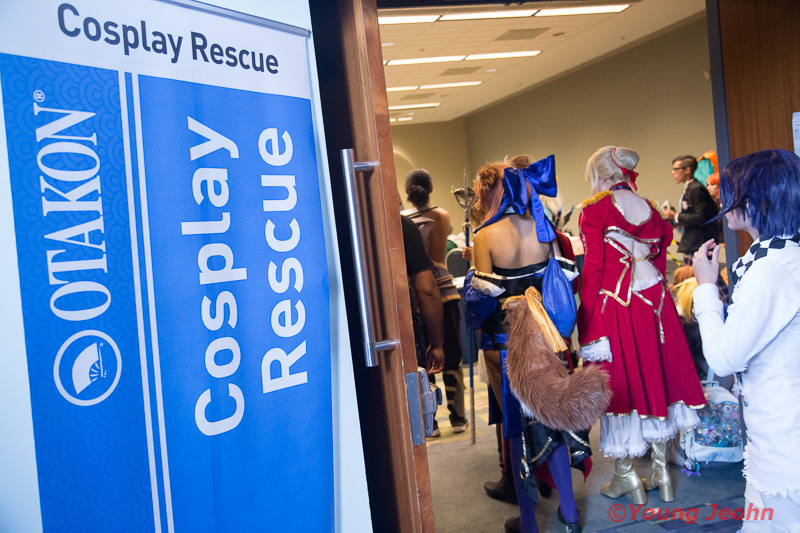 Cosplay Rescue will do their best to help you with instructions, tips and patchup jobs to get things working again.